In the July 27, 2018 Jays-White Sox game in Chicago, top of the fifth inning, Curtis Granderson was batting for the Jays with Russell Martin on third, Randal Grichuk on second, and Devon Travis on first with one out. Sox pitcher Thyago Vieira unleashed a wild one. 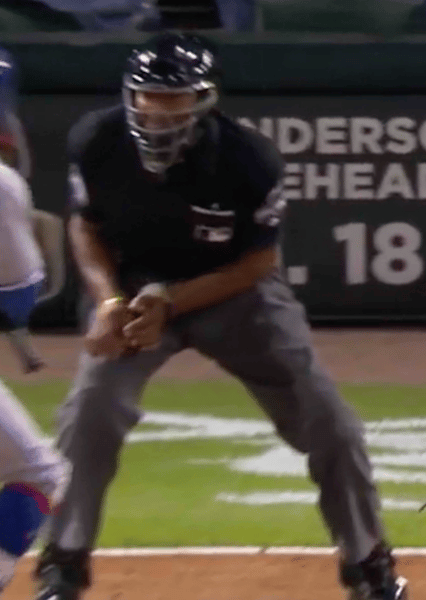 The ball bounced in the dirt and was temporarily cradled against the body of plate umpire CB Bucknor, who momentarily held the ball before the ball fell to the ground where it was recovered by Sox catcher Omar Narvaez. While Martin raced to the plate, apparently thinking the ball had eluded Narvaez, the Sox catcher was waiting with the ball. But Bucknor called “Time” and killed the play. Acting manager Joe McEwing (manager Rick Renteria was ejected earlier) met with Bucknor and crew chief Fieldin Culbreth. It was apparently decided that the ball was lodged in the umpire’s equipment because Martin was allowed to score while Grichuk and Travis also moved up a base per rule 5.06 (c) (7). Rule 5.06 (c) (7) says, “The ball becomes dead and runners advance one base, without liability to be putout when a pitched ball lodges in the umpire’s or catcher’s mask or paraphernalia and remains out of play.” In my opinion, what occurred in the Bucknor play would be a stretch to say the ball was lodged. The amount of time Bucknor handled it was minimal and did not affect the fielding of the ball by Narvaez. In my opinion, “Time” should never have been called. The closest rule that applies here would be 6.01 (f). It reads, “If a thrown ball accidentally touches a base coach, or a pitched or thrown ball touches an umpire, the ball is alive and in play.” Remember, the umpire is treated as the ground in those situations. Because Bucknor and Culbreth, in my opinion, misinterpreted the rule, McEwing should have asked for a rules-check in NYC. If there was a rules-check, I think there would have been a good chance that the Replay Official would have completely reversed the call by calling Martin out. If Bucknor had never called “Time,” Narvaez would have easily tagged-out Martin. Rule 8.02 (c) reads in part, “If the umpires consult after a play and change a call that had been made, then they have the authority to take all steps that they may deem necessary, in their discretion, to eliminate the results and consequences of the earlier call they are reversing…” In other words, whenever the umpires determine that they have made an incorrect call or ruling, they have to right to correct it and take the necessary steps to eliminate the wrong decision. The Replay Official is empowered to use 8.02 (c), when necessary. If you reconstruct the above play and eliminate the improper “Time” call made by Bucknor, Martin would have most likely been retired. Another possible remedy would have been to put Martin back on third base because it might be argued that Martin slowed down a bit because of the “Time” call. Fortunately, Martin’s run wasn’t critical. It gave the Jays a 9-1 lead in a game won by the Jays, 10-5. This crazy play happened in 1973 involving Bruce Froemming, Dusty Baker, Doug Rader, Tommy Helms and Paul Pryor. On May 15, 1973, the Astros and Braves played in the Astrodome. The Braves had runners on first and second and one out in the ninth when Dave Johnson grounded to third baseman Doug Rader, who tossed to Tommy Helms at second to start a double play. Helms relayed to first baseman Lee May to apparently end the inning, but umpire Bruce Froemming ruled Helms did not touch second, and Mike Lum was called safe. May didn’t see Froemming’s signal and thought the inning was over. He tossed the ball to first base umpire Paul Pryor, a common practice at the time on inning-ending plays. Pryor dropped the ball because he knew the third out had not been made. Meanwhile, Dusty Baker, the runner on second at the start of play, kept running and scored before May could retrieve the ball. Helms was ejected for arguing. Astros’ manager Leo Durocher argued that Pryor held the ball for 2-3 seconds which affected the play. But the call stood, perhaps because of rule 6.01 (f). My conclusion is that Bucknor improperly called “Time” and affected Narvaez’s opportunity to make a play on Martin. And since umpires are instructed to get the call right, the argument to call Martin out outweighs the argument to score him or even put him back on third base.